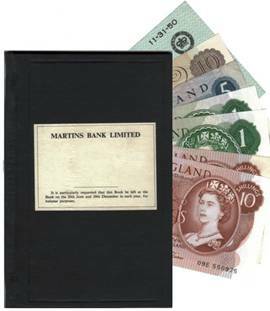 The 1960s are famous for a relaxed attitude to most things in life, but it seems many organisations - even Martins Bank itself - are a little reluctant to “let it all hang out”, (or down, or whatever it was). Even the Summer of love can’t change a series of rules that when compared to today, made our everyday lives then seem to have been the subject of more than a fair amount of state control: The price of bread eggs and milk is centrally set – indeed if a loaf of bread is to go up by one halfpenny, it is announced in the news! Exchange controls heavily restrict the amount of money you can take abroad. Only so many mortgages are made available at any one time, so you may have to keep applying to be in with a chance. 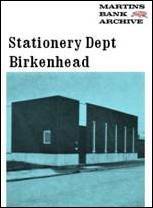 If you want a home telephone, there is just one provider - the General Post Office (???) who puts you on the waiting list for a line! Several months later, the Post Office charges you a hefty sum for the installation, citing what is referred to as “the unseen work that goes on at the exchange” as full justification both for delay and fee. The telephone receiver has to stay where ever it is first installed in your house. Surely then, in such a complex world, surely to goodness BANKING is not so strangled by red tape, is it? The rates and symbols may change, but the duty remains. If you want the luxury of writing a cheque, you have to pay the Government for it, as well as your bank! It could well have been such constraints on freedom that put so many people off having a bank account, and fuelled the idea that banking was only for the rich. Even the humble regular payments system is subject to tax - To pay for setting up a standing order (right) there is the physical process of licking a tuppenny stamp and sticking it to the mandate form! Providing your signature to the Bank is also within the eagle eyed view of the taxman when a 2d stamp is sometimes stuck to a customer’s specimen signature card (this is a card is held at the bank to check that withdrawals were being made and signed for by the right person). 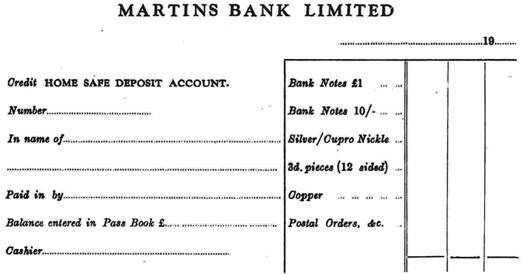 Thankfully there are a number of services over which you and your bank have some control, and this feature shows some of the items of stationery and giveaways provided by Martins Bank to make having a bank account a natural and easy process! These handsome wallets help protect your most valuable connection with us – the cheque book, and serve to show everyone who sees them that you’ve made the right choice for all your banking needs – Martins! It is just about possible to make out the Bank’s name in the golden lettering scattered in the midst of this psychedelic cheque book cover. We’d like to think that the legendary rock star and Martins Customer Jimi Hendrix might have been given one of these when he opened his account! 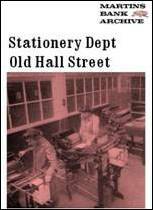 You can see a copy of his bank statement on our page for the Branch he used in the 1960s, 79 EDGWARE ROAD, LONDON . The humble money box undergoes a number of changes down the years, and we have several examples in the Archive. You can see many more examples of giveaway items in our CHILDREN’S SAVINGS and GIVEAWAYS features. So, having finally paid the duty and secured smooth passage for debits to your account, is paying IN any easier to negotiate? Don’t forget to complete this slip when you bring your handy Martins Bank HOME SAFE to the bank for opening and counting. 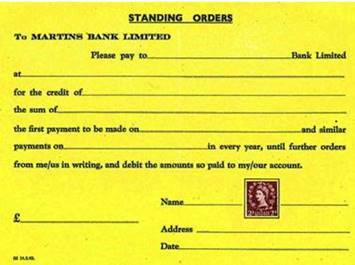 Martins Bank’s standard paying in slip allows deposit of funds to a current account . 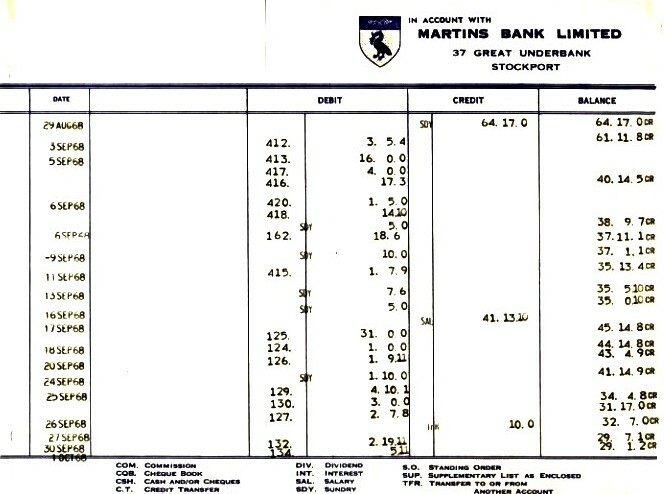 Towards the end of the 1960s this savings account paying in slip is introduced ahead of the Bank Giro Credit system. Staff at the counter are assisted by a variety of colourful paper bags into which customers are expected to place exact numbers of coins for weighing.